For the 2017 game, see Star Wars Battlefront II (2017). The GOG.com and Steam versions were updated with multiplayer support in October 2017. Crossplay between these versions is available through GOG Galaxy. Old versions of AMD's Crimson drivers can't load and display graphics correctly. See Glitchy textures on AMD graphics cards. Crashes often on more modern systems. See Crash to desktop after loading a map. CD-ROM edition with 4 discs (NA) and a DVD-ROM version (EU/some NA). Patch 1.1 Multiplayer Update 2. Offline installer is original 1.1; use Galaxy to update to multiplayer-compatible version. Steam serial keys work on retail version. The Galaxy multiplayer update removed the original icon from the executable. A replacement can be found here. CD-ROM edition was released in North America with 4 discs and a DVD-ROM version was release in Europe, though some DVD copies exist in North America. Patch 1.1 – The GOG.com and Steam versions are patched past this. Unofficial v1.3 Patch – Fixes various bugs, makes text more easily readable, and includes multiple changes for improved moddablity. Online compatible, for retail release see here. Hor+. The HUD is stretched in widescreen resolutions. 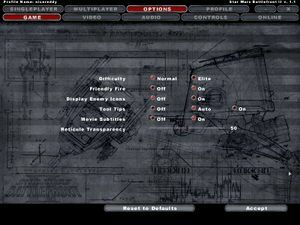 The main menus and Galactic Conquest always output at 800x600; Higher resolutions can be forced, however this is not recommended due to tiny text. Some interface elements don't appear at this resolution. Text does not scale to higher resolutions. Resolutions higher than 1920x1200 are not recommended. Locked at 80 FPS by default, unlock by using /fixedrate [number]. Only works when VSync is enabled, otherwise just uncaps framerate entirely. Set the values to the desired resolution. For example, use -resolution 1920 1080 or /resolution 1920 1080. This does not appear to work for resolutions past 16:9 and 16:10. Edit "vidmode.ini". See this post. The Multiplayer Update will always list all supported resolutions. 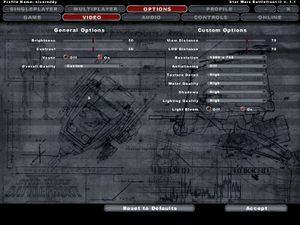 The custom resolution will always take precedence and as such it cannot be overridden from the options menu. 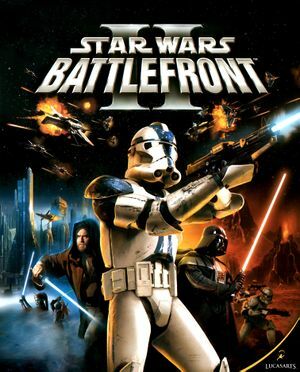 The menus may become messed up or unusable after forcing them to certain resolutions; this can be repaired with Star Wars Battlefront II Remastered. Download and install the Unofficial v1.3 Patch. When you start playing, pause the game and choose Fake Console. Set your FOV value and confirm. This will result in incomplete first-person models on higher FOV settings. Only two bindings can be assigned to a single command. See Incorrectly bound controller movement if movement is incorrectly bound. Menu can only be brought up with the "Esc" key. Subtitles are only for in-game movies. Use the Join or Create buttons in order to skip the main GameSpy login prompt. 64 Native for GOG.com and Steam. For retail use SWBFSpy or GameRanger. Use the +connect parameter followed by the IP and the port. Not available on Galaxy multiplayer update. Set the Left and Right movement stick to the X+ axis. Set the Up and Down visuals stick to the Y- axis. Right click and select "Show Disabled Devices" and enable stereo mix. Either connect a pair of Headphones, a Webcam, a microphone or any other audio device with 3.5mm jack. Open Task Manager and go to Battlefront's executable. Set Affinity to use only one or two cores to improve overall stability. Fixed with Crimson ReLive Edition version 17.2.1 WHQL. Download the 1.7.52 Version (Recommended). Extract its contents to <path-to-game>\GameData\. Better performance than the first solution. Disable FXAA in your graphics card control panel. A collection of mods can be found here. For more general mods, go here. Adds 25 new maps (including the ones from Battlefront I and the Xbox-exclusive DLC maps) and 5 new game modes. Ensure the 1.3 revision patch is installed to prevent unreadable text and bugs. May not be compatible with vanilla multiplayer servers. The Battlefront I Maps can also be found separately here. Improves the models, textures, and particle effects for the ALL, CIS, IMP, and REP factions' units and vehicles. Standalone ReShade preset that normalizes color saturation, improves game lighting, sharpens the image, and uses a more subtle bloom. Improved maps with HD textures and general re-design. Designed for the HD Graphics Mod. May not look correct without it. The beta maps are not online compatible. Replaces the character models with higher quality models and textures. Designed for the HD Graphics Mod, but still looks great without it. Adds several subtle visual enhancements, such as a smoother bloom, more realistic shadows, and a higher quality droideka shield. Allows map mod authors to enable additional visual effects. An modded version of the vanilla Mygeeto map that demonstrates what can be accomplished with this patch is available. The 1.0 release is not compatible with the HD Graphics Mod, as it uses a DirectX 9-11 wrapper. If combining with that mod, use 0.9.1 or earlier. Doing so may result in undesired effects, depending on user preference. ↑ 1.0 1.1 File/folder structure within this directory reflects the path(s) listed for Windows and/or Steam game data (use Wine regedit to access Windows registry paths). Games with Steam Cloud support may store data in ~/.steam/steam/userdata/<user-id>/6060/ in addition to or instead of this directory. The app ID (6060) may differ in some cases. Treat backslashes as forward slashes. See the glossary page for details. ↑ For example, changing #define USE_FISHEYE_CA to 0 disables chromatic aberration. All settings are labeled in a human-readable fashion. This page was last edited on 19 April 2019, at 02:42.